It has only been less than twenty years since The Blitz, since the Allies defeated the monstrous Third Reich and brought an end to the Nazi reign of terror. The Dalek Invasion of Earth does what all good science-fiction stories should do: creates a parallel to our world but puts it within the safe confines of another universe. That kind of story-telling elevates something like The Dalek Invasion of Earth from merely a strong fantasy story to allegory: what Britain would have looked like if they had failed in "their finest hour". This six-part story is unique in many ways. It is the first time in Doctor Who that a monster has made a return appearance. It is the first time that the word Daleks appeared in the title (Episode Two is called simply The Daleks). It is also the first time we lose a Companion. To combine all these elements into what was essentially a children's series is incredible: giving children the concepts of loss, state terror, and totalitarianism elevates the story to something more adult. In fact, the story (comprising the episodes World's End, The Daleks, Day of Reckoning, The End of Tomorrow, The Waking Ally, and Flashpoint) might be the first one that shifted the series as a whole from something just for the kids to something more adult, one that had a greater intelligence and a desire beyond merely entertaining. We see the end results in stories such as The Green Death, Doctor Who & The Silurians, and even up to Cold Blood Parts 1 & 2: stories that work on two levels: literal and allegorical. The story itself begins with one of the most chilling openings we've seen in Doctor Who (perhaps one of the most chilling in the entire series, both classic and revived): a man removes parts of a metal helmet and walks into a river to kill himself. Shortly after, the TARDIS materializes, and the travelers discover this is London. However, The Doctor (William Hartnell), his granddaughter Susan (Carol Anne Ford), and her teachers Ian Chesterton (William Russell) and Barbara Wright (Jacqueline Hill) sense something is wildly wrong. The city is silent: no birds, no boats, not even the chimes of Big Ben (it should be noted that Big Ben is the bell inside, not the clock tower itself). The group is split up & while Barbara & Susan are spirited away by a group of Resistance fighters, The Doctor & Ian are captured by...the Daleks, and their human slaves, called the Robomen. Now they all eventually join the Resistance: the leader, the scientist Dortum (Alan Judd), the fighter Tyler (Bernard Kay), the young man David (Peter Fraser), and the outwardly tough girl Jenny (Ann Davies). They are captured and escape at various times from the Daleks, and all go to the Dalek mining operation where the man known as Wells (Nicholas Smith) aids them in fighting the Daleks. Through the story, the feelings between Susan and David grow, and once the Daleks are finally overthrown, the Doctor decides the best thing for Susan is for her to start her own life here. He locks her out of the TARDIS, and leaves her with one of the best speeches ever delivered in the series. The Dalek Invasion of Earth, more than any other Dalek story since (and far more directly than The Daleks) draws on the parallels between the Daleks and the Nazis. This is most obvious in Episode 6 (Flashpoint), when the Daleks refer to the extermination of the humans as "the final solution". The phrase itself, "extermination", is also reminiscent of Nazi racial ideology. 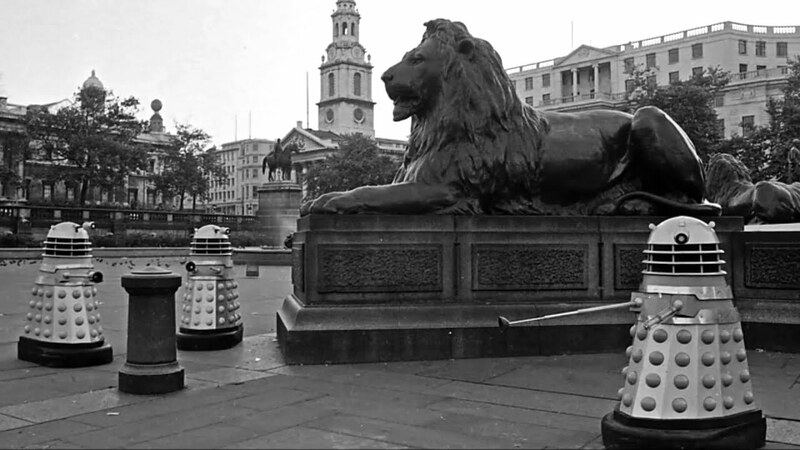 Even in one of the most frightening scenes in the story, when the Daleks wander around an abandoned London, the connection is clear every time the Daleks raise their plunger arms in a Nazi-like salute. If one expands the concept of Daleks as Nazi substitutes, we see what a defeated Britain would have looked like: empty, desolate, with the population either being collaborators (the Robomen, albeit unwillingly) or Resistance fighters. To those who had survived and endured those years of war, seeing Daleks/Nazis overrun their capital must have been more terrifying than the aliens themselves could be. For the children, it's the idea that this frightening alien force is in the here and now, in their world, bringing them into terrifying proximity. The imagery of The Dalek Invasion of Earth is aided by Francis Chagrin's score. In Episode 1 (World's End) and Episode 3 (Day of Reckoning) the music is very minimalist: consisting of drumbeats and what sounds like hammers tapping all mashed together, they give the moments with no dialogue an even more sinister, menacing, frightening tone. Richard Martin keeps things flowing remarkably fast in spite of a six-episode story, and some of the imagery he created is still impressive: the aforementioned Dalek wanderings through London and the Resistance attempting to avoid them, the Dalek emerging from the River Thames in Episode 1, the camera moving closer and closer to match the ticking of a bomb at the end of Episode 3. This was an extremely ambitious story, and on the whole it succeeds. The performances are excellent from the guest stars. Kay's gruff fighter is balanced against Judd's rational scientist. Fraser and Ford, under director Martin, made wise decisions to allow the relationship between David and Susan grow slowly, and the scene where David flirts with Susan with the aid of a fish is beautifully shot and acted. It's here that writer Terry Nation allows a bit of levity into a very dark story-line, and even gives The Doctor a good quip. When told that they were just cooking a fish, he replies, "I can see something's cooking", with the subtext clear. Fraser and Ford are both extremely believable as two young people discovering love for the first time, or at least serious love. Smith, whom we know mostly as the inept department head in Are You Being Served?, is very strong as the leader of the mining rebels. He is tough, shrewd, caring to his fellow slaves...all the qualities antithetical to Mr. Rumbold. Davies' Jenny at first appears tough and aloof, but as the story goes on we begin to see the vulnerability and heartbreak within her. As a side note, there was discussion of her taking Ford's place as a Companion, and while it could have been worked out I don't know if it would have been good to have such an integral and important character replaced so easily. Children and teens would have identified most with Susan, and seeing her be replaced by another teen girl so quickly might have been jarring. Rather, the fact that the ending to The Dalek Invasion of Earth is rather open-ended (only the second time the ending of one story doesn't lead into the beginning of another, the first being the transition from The Keys of Marinus to The Aztecs) gives the audience a time to mourn and reflect on just what a powerful ending the story has. One day, I shall come back. Yes, I shall come back. Until then there must be no regrets, no tears, no anxieties. Just go forward in all your beliefs, and prove to me that I am not mistaken in mine. Even now, his delivery of his entire speech, and the genuine sense of loss he expresses, still makes it a hallmark for all future Doctors to measure themselves with. Curiously, he never did "come back", at least on screen*. Hill and Russell both have their moments, as when Barbara has to flee for her life in Episode 1 or Ian deals with Wells and a smuggler in Episodes 4 & 5 (The End of Tomorrow and The Waking Ally). They continue to act well but have the benefit of knowing their characters very well. The flaws, though few, are still evident. The biggest was The Slyther, some form of monster that was described as a "pet" of the Daleks. Why the Daleks would want a pet of some sort is a mystery, though I'm sure he really wasn't an actual pet but some form of guard against escape in the mines. The actual look of the Slyther is rather odd if not downright silly--a rubber monster that did look like a deranged Christmas tree. It's up there with the Myrka from Warriors of the Deep as one of the worst in Doctor Who. The entire reason for the invasion: not for conquest but to take the Earth's core and pilot the planet around like a ship (as far as I could make out) seems so flat-out bizarre. Why on Earth would the Daleks want to fly around on the Earth? The two women in the woods bit wasn't needed and almost stopped the story cold, and I don't remember where Jenny went after the revolt began. She just disappeared, which I thought was curious. Overall, with the action, romance, terror, adventure, Nazi analogies, and loss within The Dalek Invasion of Earth, Doctor Who created one of its best stories so far. Fare thee well, fair Susan. *Susan and the First Doctor did in a sense reunite, when they were brought together for The Five Doctors. However, as of yet no television story has featured Susan or explained what happened to her after she was left on Earth with David.